As you buy baby clothes and receive them as gifts and hand-medowns, you’re probably diligently washing them, along with your baby’s bedding and towels. You’ll find several brands of laundry soap specifically made for babies, such as Dreft, which are especially helpful if your baby has sensitive skin. You might find that it’s convenient to wash your baby’s clothing separately. Tiny little socks worm their way into adult’s sleeves and pant legs, and grippy baby washcloths cling to any cotton clothing. Mesh lingerie bags are handy to zip these small articles into to wash and dry. Plus once your baby is born, you’ll probably find that you do his laundry much more frequently than the rest of the family’s. One important laundry precaution: Don’t use fabric softener on any infant or children’s clothing or sleepwear that’s labeled flame retardant. Fabric softener might reduce the clothing’s flame retardance. 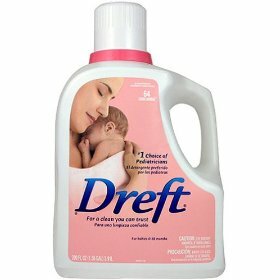 One brand of baby detergent that’s readily available nationwide is Dreft. It costs around $9.50 in grocery stores for a 50-fluid-ounce bottle.